Let’s make this clear right away: While we are a part of the QuickBooks ecosystem, the QB Community welcomes all small business owners, whether or not you use QuickBooks. Our mission is to create a community of entrepreneurs and experts to share advice, tips, strategies, resources and, most of all, first-hand experience to help bring your business to the next level, together. Here are three things you can do right now to get the most out of QB Community. Start by sharing your story. Who are you? What kind of company do you own? How long have you been business? Complete your profile, including a photo and a link to your website. The more you share, the easier it will be to connect with other members facing similar challenges and seeking similar opportunities. Hit a bump in the road? In the QB Community, there’s no such thing as a dead end. Post your question, concern or quandary, and soon you’ll have answers, advice and feedback from other members. Give it a try! Search on Topics to find and join conversations that are most relevant to you. (Topics are organized by the various stages of small business development and growth.) Remember that every time you share a learning, a mistake or a success, you’re helping someone else in a similar situation -- so feel free to pay it forward! Want to hear more about a member’s experience or ideas? You can message people privately to continue a conversation. 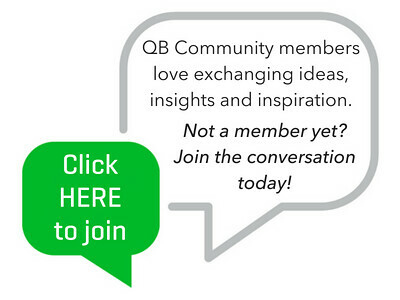 At QB Community, we're passionate about inspiring real conversations around the topics that matter most. Like developing a new idea. Setting realistic business goals. Growing your customer base. And building meaningful relationships with other folks committed to working for themselves. With that in mind, this is not the place to promote your business or spam other members. If you’re about to post a message that advertises your business or promises incredible riches (possibly written in ALL CAPS! ), stop. We will delete it. This is a safe place for conversation and learning. As your hosts, we take this commitment seriously. To learn more about our dos and don’ts, please read our posts, QB Community Rules of the Road & Why We Decided It's Not Okay to Promote Your Business in the QB Community. Re: Welcome to the QB Community! I really appreciate being able to be a part of this community. The encouraging feedback is welcome as is the "safe" environment that allows one to ask questions openly. Thanks for the first steps on this roadmap, however, I can not upload the banner image on my profile. Any idea why that is? I have reached out to our team and I will get back to you ASAP! Thank you for having me. I hope to learn as much as possible about QuickBooks. Welcome, @Gutter! Our community members are a great resource, including you! Looking forward to your contributions and feedback on your experience here. Love your profile pic, btw. Thank you for the invitation. I am starting here to learn more about network with the Intuit QuickBooks community. I recently signed up for quickbooks, and even more recently signed up for the community, and am happy to be here. While I'm experienced in my field (graphic design & branding) – I'm new to running my own business, so I'm hoping to gain some knowledge from both those who are on the same journey as me, and those wise old heads who have 'been there, done that'. I expected there to be a 'introduce yourself' section – searching for it brought me here – and I now see it's in the biography section – so I'm off to fill out mine properly now. In any case, we appreciate your sharing a bit about yourself here, as well as on your profile page. It's great to meet you! Hello! Hope you all enjoyed Christmas and New Year Holidays! This is so cool to have a community here a place to help others. Thank you! I am new here. I am just starting to use QB for the first time for this year 2019. I cannot believe I am saying 2019 now. LOL. I am Landlord just started recently 2018 and had first tenant. Unfortunately my first tenant paid few times and continue to live in my house so I had to evicted my first tenant. I have asked few CPA how to do about "LOSS" that the tenant did not pay rental and yet living in my house for several months. The CPA kept saying they will do the form etc but I need to pay CPA. All I need to know if I can use "LOSS" in the 1040 somewhere to help reduce taxes? I am new here and I am not sure if my note here is in the right place to ask a question. Thank you in advance. Hope to hear back soon.